Hello lovelies! 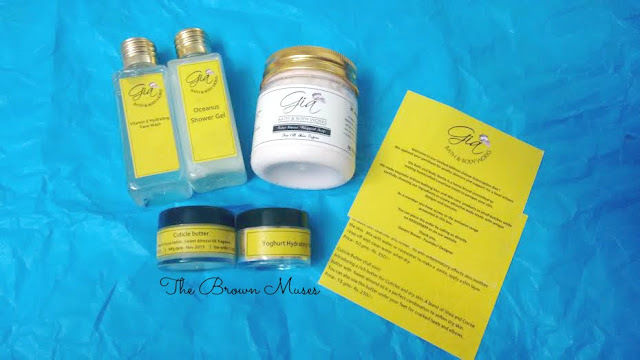 To start off the week on a pleasant note, I am here with the first look and review of November Subscription Box by a famous handmade and naturals treats brand Gia Bath And Body Works. I have never been into purchasing subscription boxes that much however the idea of one has always excited me. This is my second subscription box ever by any brand. What catches my fancy is that you get to lay your hands on many different things at once. It's now a known fact that I am massively into handmade and natural treats therefore I had to order this wonderful box. I feel this is also great for those people who want to try handmade treats but shy away due to the price tag they come with. One gets to try different types of products at a great price, All the products in the box are deluxe size (anything above 10 ml is deluxe size). The box for the particular month contained two full size products too which is awesome! 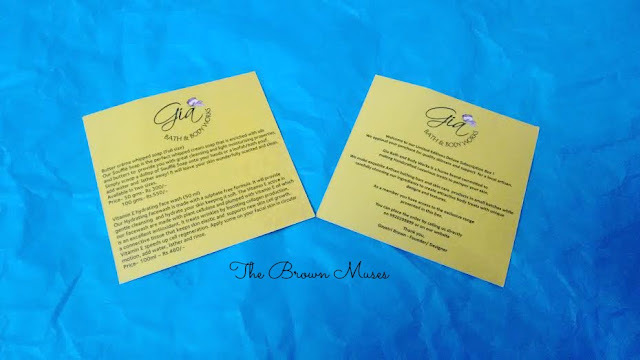 Here's a detailed breakdown of the handmade treats I received in November Subscription Box. Butter Creme Whipped Soap (50 gm): This was a full size product. I have used butter creme whipped from GBABW previously and have absolutely loved them! I even reviewed two variants here. The box contained strawberry and champagne variant and I am so excited to use. The whipped soap smells actually like strawberries and champagne! Vitamin E Hydrating Face Wash (50 ml): This is one of the product from one of brand's recent launch. It smells amazing! I cannot wait to use it. The bottle this face wash comes in is too cute lol. Oceanus Shower Gel (50 ml): This shower gel smells divine.... ah. I have used this product earlier and it is awesome. It was hydrating for my dry skin and did a great job of cleaning. Moreover, it was mild on the skin so I guess it's safe for children too. The size is perfect for carrying during travels. Yoghurt Hydrating Face Mask (15 ml): The presence of yoghurt in a face mask was impressive enough for me. I have not started using it yet but I think I will love it when I do! The size is perfect to travel with. Cuticle Butter (15 gm): I love love love it's smell! I was telling Mrs Brown, the founder of the brand that there should be a candle in this scent. The scent is super relaxing and the butter is deeply hydrating, I used it once and loved how it healed the peeling cuticle skin, something that my poor cuticles have to go through during cold months. Overall, I was super impressed by the contents inside the box and of course the price is impressive too. I liked how the brand included deluxe size products which will give one a chance to use the products more than once. Will I recommend: Yes, of course! Go for it. To place your orders for the December box click here. Disclosure: This box is my own purchase and the views and opinions expressed hereby are strictly unbiased, based on my personal experience.